Ten years of austerity budgets have left North Carolina’s education system – public schools, community colleges, and university system – with incredible needs. Compared to before the Recession, the state is providing public schools with fewer teachers, instructional support personnel (nurses, librarians, counselors, psychologists, etc. ), teacher assistants, textbooks, and supplies. The North Carolina Community College System is burdened with a $53 million “management flexibility” cut each year, and faces substantial workforce development needs. Several campuses are facing budgetary shortfalls due to Hurricane Florence. In the UNC System, state funding per full-time student has been slashed about 20 percent. Given the laundry list of needs facing North Carolina’s education system, how excited would you get about a budget that would increase real education funding by 0.3 percent? Because that’s how much House Budget writers have committed to addressing the state’s non-salary education needs for next year. 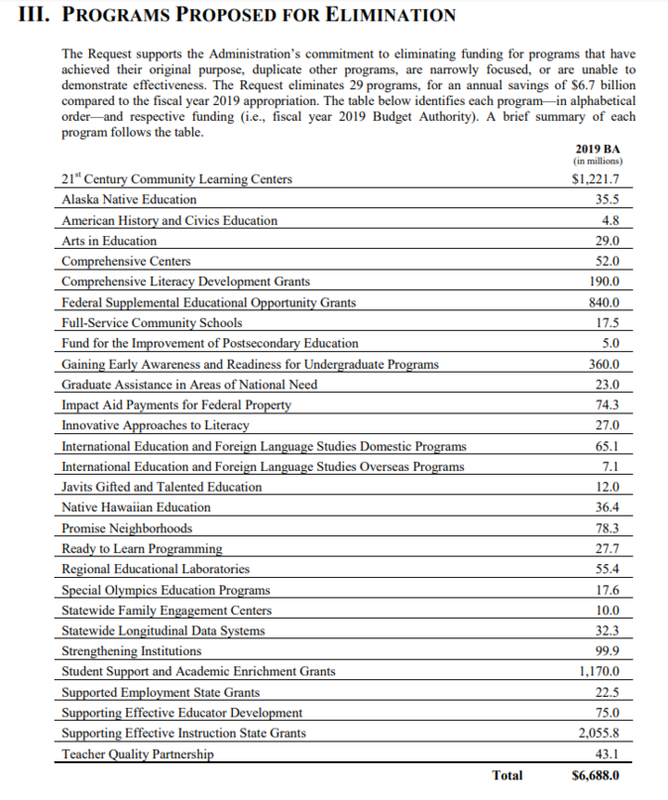 On Tuesday, budget writers from the House Appropriations Committee on Education revealed that they will have just $45.0 million to spend in FY 19-20 and $63.6 million in FY 20-21. It is important to note that the above does not include salary increases, which will be added on top of the proposed spending targets. However, if you look at the laundry list of needs above, they all list non-salary shortfalls. While our educators need competitive pay, they also need more resources. Children need books, supplies, teacher assistants, instructional support personnel (nurses, counselors, psychologists, librarians, and social workers), assistant principals, and teachers. Just restoring these areas to pre-Recession levels would cost $593 million. Doing something moderately ambitious like funding school support staff at industry-recommended levels requires an additional $600 million. What the minuscule House budget targets make clear is that General Assembly leadership has no interest in creating a world-class education system in North Carolina. They have instead committed themselves to keeping taxes low for corporations and wealthy North Carolinians. For example, a 5 percent corporate income tax rate would generate $604 million – or more than enough to restore funding for textbooks, supplies, teacher assistants, instructional support personnel, assistant principals, and teachers. A millionaire’s tax would generate an additional $362 million. Reinstating the state-level estate tax would generate at least $70 million per year. In other words, there are easy way to pay for the things our education system needs…if you actually want to pay for things that the education system needs. But these minuscule House budget targets show that the General Assembly clearly has other priorities. On May 16, more than 20,000 educators and public school advocates marched on Raleigh to demand better funding for North Carolina’s public schools. He proposed paying for these investments last year by delaying then-planned tax cuts for corporations and North Carolinians earning more than $200,000 per year. Ultimately, the General Assembly chose a different route, moving forward with tax cuts in 2019 that are now draining more than $900 million per year from state coffers. When added to prior rounds of tax cuts since 2013, North Carolina’s coffers are now missing $3.6 billion a year. These tax cuts are making it impossible for state leaders’ to make the school investments called on by Cooper and the May 16th marchers. On May 16, over 20,000 teachers descended upon Raleigh to encourage legislative leaders to increase funding for North Carolina’s public schools. The impressive labor action – which shut down 40 school districts across the state – came on the heels of teacher-led protests in other states such as West Virginia, Oklahoma, Kentucky, and Arizona. 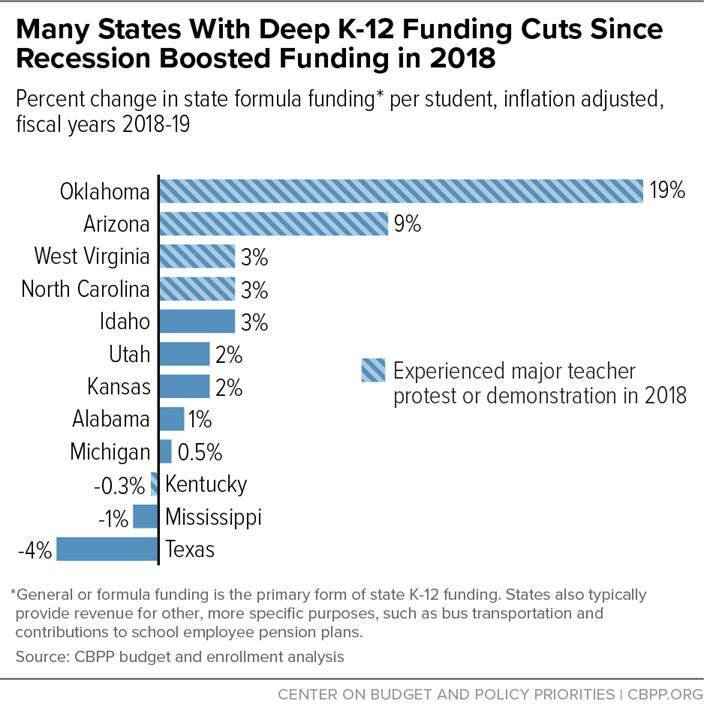 According to a new report from the Center on Budget and Policy Priorities (CBPP), these protests helped: in four of the five states with large-scale teacher protests, including North Carolina, legislators responded by increasing school funding. 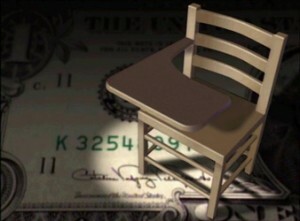 According to the report, per-student, inflation-adjusted state funding rose 3 percent in North Carolina. While educators and other public school advocates deserve praise for pressuring legislators to increase school funding last year, North Carolina’s school budgets have a long way to go to make up for prior-year budget cuts. Analysis of state budget documents shows that per-student state funding for public schools remains 5.4 percent below pre-Recession levels when adjusted for inflation. However, that number understates the actual budget pressures facing our schools. Recent-year funding increases have targeted teacher pay raises and covering rising retirement and health care costs. While such investments are important, they don’t ensure that North Carolina students have every tool they need for educational success. 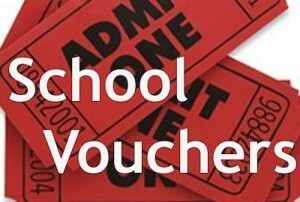 North Carolina funds its schools via specific funding allotments. Dollar allotments provide districts a fixed pot of funds for certain activities. Position allotments provide districts with a given number of positions, with the state taking responsibility for paying the appropriate salary for the given position. Of the 20 largest dollar allotments in FY 2008-09, 15 remain below their pre-Recession levels. 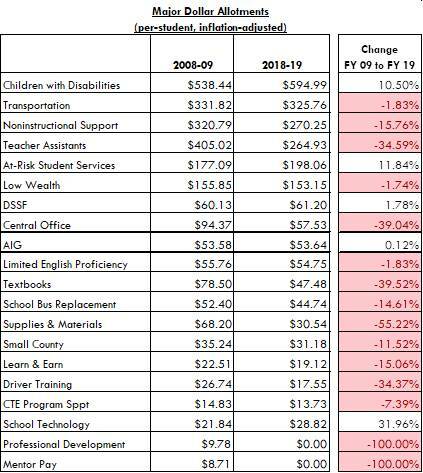 The General Assembly has massively slashed funding for supplies and materials (down 55 percent), textbooks (down 40 percent), central office staff (down 39 percent), and teacher assistants (down 35 percent). Funding for professional development and mentor programs for beginning teachers have been eliminated entirely. The story is no better for the state’s position allotments. Of the four position allotments that existed in FY 2008-09, three remain below their pre-Recession levels. Compared to before the Recession, the state is providing schools with fewer teachers, instructional support personnel (nurses, librarians, counselors, psychologists, etc. ), and school building administrators (principals and assistant principals). According to the CBPP report, North Carolina is among the minority of states that still finds its school funding below pre-Recession levels. And the report notes that North Carolina sits alongside Arizona and Oklahoma for using deep school funding cuts to pay for corporate and personal income tax cuts that have mostly benefited the wealthy. As a result, North Carolina faces a budget shortfall of $1.2 billion in 2020, increasing to $1.4 billion in 2022. We’re already seeing the negative impact austerity budgets are having on North Carolina’s public schools. Other states are increasingly passing us by, and students of color and those from families with low incomes are increasingly paying the price. An alternative path – one which adequately funds our public schools – can improve educational outcomes for students and boost long-term growth. 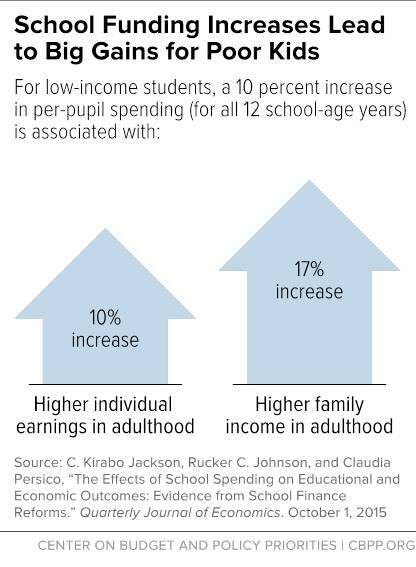 The report highlights that investments in public schools have tremendous long-term impacts, particularly for children from families with low incomes.